Snow, closures expected in eastern Colo. Thursday a.m.
DENVER – It’s springtime in Colorado, which means Monday and Tuesday’s high temperatures in the 70s will be a distant memory by Wednesday evening, when snow and high winds are expected to move through Colorado as another “bomb cyclone” is expected to build across the Midwest. 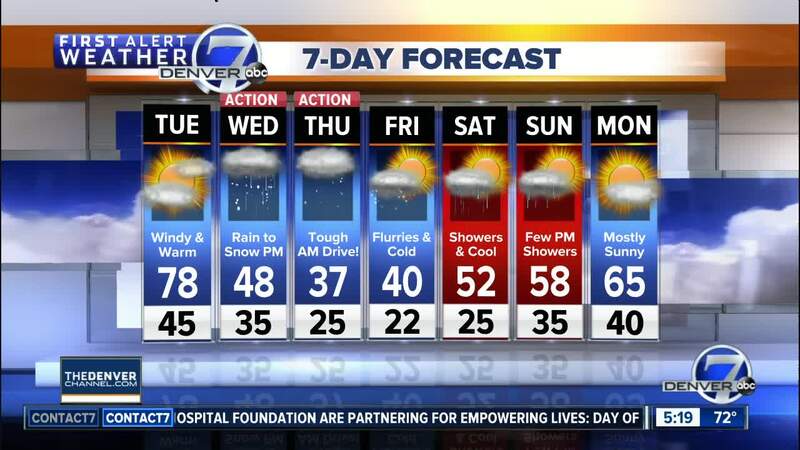 Forecast highs for Tuesday in Denver are in the upper 70s and reached the mid-70s on Monday. MORE: Blizzard warnings were issued for much of northeastern Colorado on Tuesday ahead of the storm. Click here for a Tuesday update on the incoming snowstorm. But several metro-area counties, including Arapahoe, Adams, Boulder and Elbert, saw winter storm watches issued Monday for the upcoming storm. The watches are in effect from noon Wednesday until noon Thursday in Elbert, Arapahoe and Adams counties and from 6 a.m. Wednesday until noon Thursday in Boulder County. On Monday, there were wind advisories and some fire warnings issued in various parts of the state – particularly the Western Slope – as the storm begins to build in the western U.S. A wildfire forced evacuations west of Lyons in Boulder County Monday afternoon. But the warm temperatures will be gone as soon as they arrived by mid-week. A storm system moving in from the Pacific is expected to create “bomb cyclone” conditions similar to those that wreaked havoc across Colorado and the Midwest in early March, though the conditions are expected to develop slightly further east – in places like Kansas, Nebraska and South Dakota, which were ravaged by flooding after last month’s bomb cyclone. Temperatures are expected to drop by 40 or more degrees in parts of Colorado over the next few days. Rain will develop across the Front Range on Wednesday and is expected to turn to snow in the afternoon or evening hours. The Denver metro area could see around 6 inches of snow by Thursday morning, according to Denver7 Chief Meteorologist Mike Nelson. More snow is possible along the Palmer Divide and Eastern Plains, where blizzard conditions could exist by Thursday morning and highway closures are anticipated. Schumacher told the AP that bomb cyclones typically develop every couple of years and said it’s unusual to see them this close together. Still, he said it was difficult to blame the back-to-back phenomenon on climate change. For the latest Denver7 weather forecast, click here . For more weather information from the Denver7 meteorologists, click here.